Does it seem like your thingie isn’t holding its charge as long as it used to, or like a full charge doesn’t give you as many hours of use as it used to? 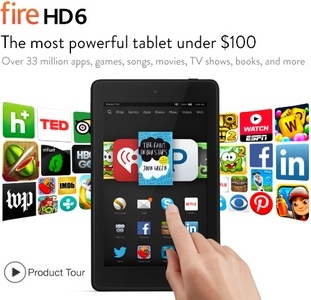 Does it seem like your last thingie died a lot sooner than you expected? It’s recently come to my attention that many folks don’t know two crucial things about charging their devices with rechargeable batteries, and that’s where the trouble begins. Rechargeable batteries lose a little bit of their holding capacity every time they’re overcharged. By “overcharged”, I mean when they’re plugged into an outlet for charging beyond the time it takes to fully recharge the battery. **UPDATE 1/23/14** To anyone who’s thinking it’s not possible to damage a rechargeable Lithium Ion battery by leaving it plugged in too long, see this DMM post, where I discuss the difference between what’s technically correct about Li-ion batteries vs. real-life usage and performance, using the Boeing Dreamliner battery fires of 2013-14 as an example of real-life Li-ion battery failures due to overheating. Plenty of people are in the habit of plugging in their device at night before bed and leaving it plugged in all night. DON’T DO IT! Even a fully-drained rechargeable battery should take six hours or less (usually, MUCH less) to reach a full charge, so leaving your thingie plugged in all night pretty much guarantees you’re overcharging* the battery. *4/27/13 UPDATE: based on a comment made by a reader, I’ll clarify that where I say “overcharge”, I’m referring to damage caused both by what electrical engineers technically consider “overcharging” AND the overheating that can occur when certain types of rechargeable batteries are left charging longer than is necessary. Both types of damage are caused by leaving a rechargeable battery plugged in to charge for too long, so for simplicity’s sake I’m referring to both as “overcharging”. If you want the technical nitty-gritty, scroll down to my lengthy reply in the comments section below this post. This practice reduces the capacity of your rechargeable battery bit by bit, meaning that a full charge lasts a little shorter each time you recharge, and since rechargeable batteries can only be recharged so many times, it’s also reducing the life of your battery overall. For devices where the battery can’t easily be replaced, this practice means you’ll have to buy a new device that much sooner, too. Sure, it’ll look great on your desk. But it’ll also be adding to your electricity bill every minute of every day. The vast majority of chargers draw power anytime they’re plugged into the wall, whether they’re actually charging a device or not. You can get specially designed chargers that don’t do this, but they’re expensive and the charging cables that come with devices aren’t of this special type. While it’s true that regular charging cables draw less power when they’re not actively charging, the bottom line is that you’re still paying for electricity that’s going nowhere. 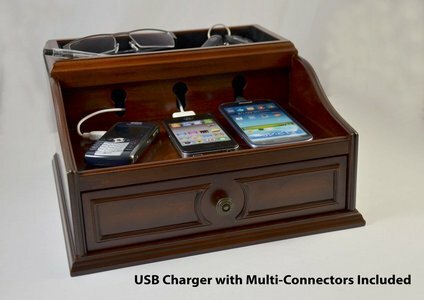 So while those little electronic device caddies with holders for each of your devices, little openings for each cable, and a plug that’s supposed to stay in the outlet at all times may do a bang-up job of de-cluttering your desk or kitchen counter, using them pretty much ensures you’re paying for watts you’re not using. Anker full-speed portable chargers and backup power supplies are consistently very highly-rated by consumers, and they’re also very reasonably priced. Anker products are designed to provide maximum functionality with minimal hassle, and range from an individual backup power supply (currently priced at $30) to a 9-port USB hub (currently priced at $60) that includes one charging port: you can plug the hub into your computer’s USB port to enable connection of up to nine other USB devices, and even provide charging capability for one of those devices. 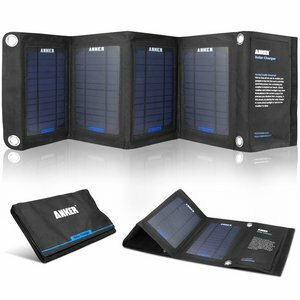 Anker also offers a foldable solar charger that’s currently got an average review rating of 4.5/5 stars and is priced at $70. Whatever your USB hub or portable power needs, Anker’s got you covered!